Heather Ritche first travelled to The Gambia in February 2007 when she carried out a successful feasibility study: she was amazed at how quickly the blind people she taught at the GOVI (Gambian Organisation for the Visually Impaired) Resource Centre learned to make rag rugs, even though she didn't know their language. Rug making is a tactile skill: a blind student can create a random-patterned rug and, after they have mastered the technique, they will need very little help to fill in a complex and beautiful design based on local motifs if a sighted person hooks/prods the outline onto the hessian and sorts the fabric into colours. Heather returned to The Gambia in December 2007 for another workshop session at the GOVI Resource Centre. Some of the previous students returned but many of the 35 people who attended were new to the craft. Heather would like to set up a permanent workshop in The Gambia at which children and adults will be taught the technique of rug making. 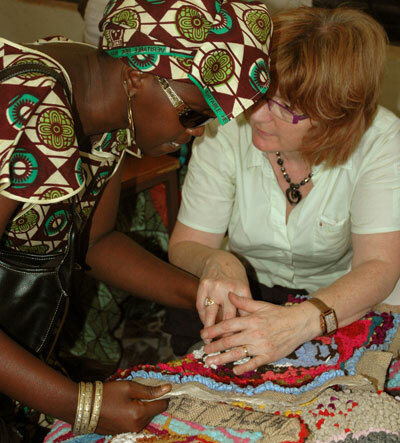 While she was in The Gambia, Heather met an extended family of sighted and blind people who were very keen to develop the skill of rug making into a cottage industry. Doing this would help the blind family members, giving them an alternative to begging. Heather was introduced to this family and the GOVI Resource Centre for the blind in Serrekunda by the Friends of Govi, a UK based charity. The resource centre, which includes the only school for the blind in The Gambia, is run by GOVI: on every visit, she has worked closely with GOVI and the staff of Sightsavers International and one of her advisors is her daughter, Chrissie, who works as a rehabilitation officer for people with visual impairments. Chrissie is always a great help to Heather, setting up the workshops as well as running mobility sessions with the staff of the GOVI school. For Heather and Chrissie vocational and rehabilitation training are both very important, which is why Rug Aid will be supporting an ongoing training programme Chrissie will be running for the eight rehabilitation workers who are responsible for all the blind people living in The Gambia. If possible, Heather would like to hold further workshops at St John's School for the Deaf in Serrekunda. For disabled children in The Gambia the future is bleak without the education they enthusiastically crave and richly deserve. Many children at the school at the GOVI Resource Centre come from backgrounds which would distress even the most stony-hearted person. It is not unusual for children who are blind to be abandoned by their parents. GOVI and the Friends of GOVI (UK) offer these children hope, security and justice in a world which previously offered them nothing. The community-based rehabilitation project associated with GOVI and funded by Sightsavers International seeks to help older blind people to become independent, self-sufficient and respected members of their community. Rug Aid works alongside this project and shares its goals. Zanzibar was the first African country in which Heather wanted to start a Rug Aid workshop: it proved almost impossibly difficult but she is determined to get a project going there one day! Wherever the projects are located, teaching children and women the skill of rug-making would empower them, giving them a source of income independent of climate change and the vagaries of nature. At a later stage, working with fair trade organisations like Traidcraft would ensure the producers get the maximum benefit from their work: any surplus proceeds would be reinvested in developing further projects, with partner organisations in other countries.